We decided to get up early for our departure. 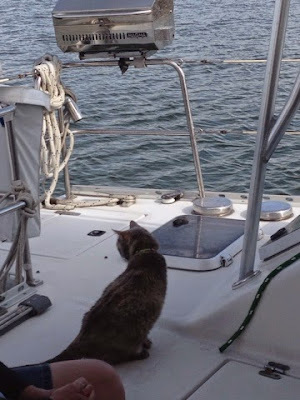 It was an easy departure off the mooring ball, (First Mate released the lines running to the boat from the mooring ball & motor away) and we were hoping to beat the worst of the winds. We're also going 5 miles farther than last time (doesn't sound like much, but we're only doing 5 kts avg SO that's an extra hour). 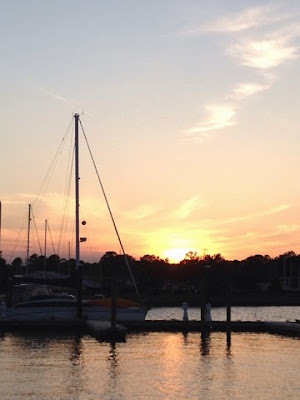 We motored out of Patuxent River and put up the sails. We motor sailed for awhile and when we decided we could maintain a close reach across our course, we shut the engine off. We were able to do some pretty long legs before having to do short tacks back across to avoid the shipping channel. Our catamaran can maintain about 45 degrees off the wind, which is about normal for the style of boat. We had the water to ourselves today. The downside of leaving early was it took another hour for it to warm up outside--loving all the layers I brought. 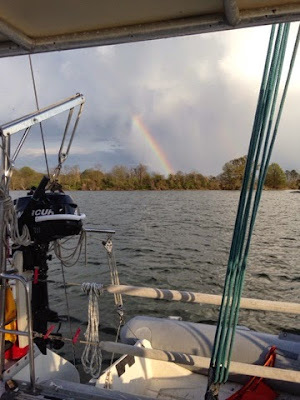 As we approached the Potomac, the winds started to gust to 20. 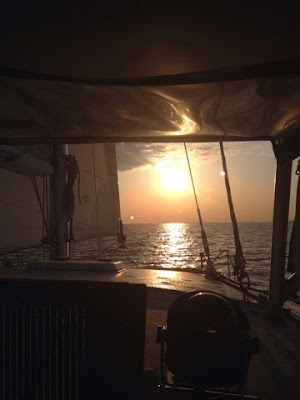 We furled the genoa, put a reef in the main and started an engine. Our first turn put us bow first into the waves. This was not our favorite. The small, choppy 2 ft waves were close together, so it was a constant up and down. We cut the next corner and the waves off our quarter was a little better. We made the last turn into the Potomac and it didn't smooth out at all, so we started the second engine and dropped the main sail. We were now taking the waves broad side, which was surprising more comfortable. (The kayak stowed across the bow starts to work its way loose & flips itself over. It will find a new home against the starboard stanchions. Inconvenient for docking & getting into that locker, but better than losing it overboard). We found Smith Creek and made the turn. 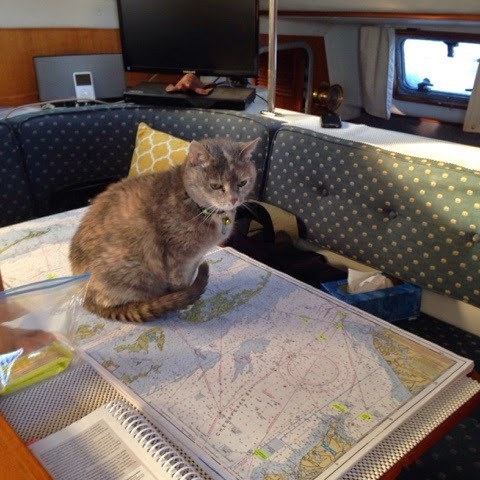 It was still 20 kts of wind in here, so we looked for a calmer spot to anchor. Deep Cove was a possibility but we passed it by, for what was supposed to be, an excellent cove. We didn't like the look of the shoal at the entrance, so we motored onto the next cove off our port. After much discussion (you would like to be sheltered from the wind but also have to visualize how the boat will swing with a wind shift. Will that put us to close to shore? ), we finally dropped anchor. Stats: 2 ft seas, gusting to 20, saw max 40 ft depth, 38.4 miles, 7:18, avg 5.3 kts, sailed at least half of that. Spaghetti with ground turkey and mushrooms for dinner. Amelia the Cat. "Interesting. Where's the grass?" Rain showers move through and we're rewarded with a rainbow. We hear from our friends over at theretirementproject.blogspot.com. They are heading north from the Bahamas back to Annapolis. It looks like we might cross paths around Norfolk. My Captain sleeps in while I warm the boat by baking brownies. We think we're in the middle of nowhere, but at 8:00 am the Star Spangled Banner plays over a loud speaker. Interesting. We spend a day here, resting and working on the boat (Captain's chair squeaks, tighten shrouds, autopilot constantly beeps even though it's maintaining heading, wind direction indicator off 15 degrees.) Apparently, we're also very close to an airport. KING AIR! We had this secluded cove to ourselves. We've officially left Maryland and are in the south, ya'll!